Nowadays, there is no shortage of exercise machines that promise various health and fitness benefits, and the elliptical machine is certainly among them. The list of elliptical machine benefits range from weight loss to improvement of cardiovascular health; no wonder it is one of the most sought after exercise machines in the market today. With such a tough lineup of competition, many users find it a daunting task to find the best elliptical machine suitable for their needs. However, with its outstanding features and specifications, the ProForm 1110 E Elliptical Trainer has no problems standing out. In fact, it can definitely hold its own, even against more expensive models, such as the Sole E35 Elliptical Machine. The frame of this elliptical training machine from ProForm is made from high-quality commercial-gauge steel, which means durability will never be in question. Everything about it, from its solid body, to its front-mounted wheels and smaller components, is built to last. Indeed, you can expect to be using this machine for years and years to come. In fact, it is so solid and heavy duty that it can accommodate someone who weighs even up to 375 lbs. Owners of the ProForm 1100 E Elliptical Trainer will be protected by its Lifetime Warranty for the frame, 5-year warranty on its parts, and 2-year warranty for labor. This trainer is comprised of durable and high-quality parts that perfectly complement its solid frame. Theoversized cushion pedals are easily adjustable and, as mentioned earlier, it has transport wheels mounted on the front for mobility. Aside from its 8-inch Coolaire workout fan, it also has a water bottle holder integrated into its design, both meant to give you more convenience while using the machine. Of course, the elliptical machine benefits obtained from this particular unit does not only pertain to health and fitness. Who said working out should be boring and monotonous? The 1110 E Elliptical Trainer also comes with an iPad Holder, which is basically a removable iPad shelf where you can secure your iPad so you can use it while working out. It also features iPod compatible audio, so you’ll never be without your music while sweating it out. 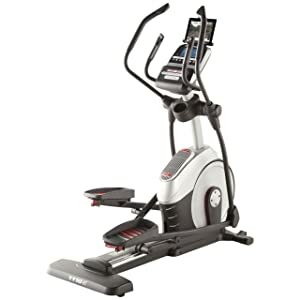 Just like the Sole E35 Elliptical Machine, the ProForm 1110 E Elliptical Trainer has a 20- to 22-inch power adjustable stride. Tweak its position, depending on your height, so you can get more muscle definition with every workout. This adjustable feature also means that every member of your family can have a go at this elliptical machine. Expect a smooth and hassle-free workout session every single time, with the ProForm 1110 E Elliptical Trainer’s SMR Silent Magnetic Resistance System. This frictionless system works so quietly and lets you easily adjust the intensity of your workout seamlessly, without any interruptions. If you want a more intense workout, or you are targeting to burn more calories, you can choose among the 25 digital resistance levelsthat the ProForm 1110 E has to offer. You will be able to make the most of the elliptical machine benefits of this particular trainer since it comes with 32 preset workout apps: 16 Calorie Workouts and 16 Performance Workouts. All these workout options have been designed by a certified personal trainer. You won’t have to worry about setting resistance levels, since the resistance will be automatically adjusted accordingly once you’ve picked the program you want. This ensures that you will achieve the best elliptical machine benefits for every session you undergo with this unit. You won’t have any trouble operating this machine, thanks to its integrated Quick Touch handles. Here’s another bonus: ProForm has equipped this elliptical trainer with its proprietary training program, theiFit technology. Working out becomes more interactive, since you can now customize your workout, have access to Google Maps and to a certified personal trainer, and automatically monitor your progress. This elliptical trainer boasts a 7-inch backlit iFit Display with a large viewing angle. It clearly displays vital workout information, such as Time, Speed, Distance, Heart Rate, Calories Burned, and Resistance. It also features a dual-grip EKG Heart Monitor, by way of heart rate sensors built into the handlebars. The unit comes with a Polar Wireless Chest Strap which, when placed around the chest, will transmit information regarding your heart rate to the system, and display it clearly on the LCD screen. One look at the Soft Touch Upper-Body Grips and the cushion pedals will immediately tell you that this is one machine you will be completely comfortable with. These upper-body resistance arms will give you that total body workout and cardio exercise that you are looking for, burning more calories and giving your muscles more definition. The oversized pedals are also designed in such a way that the foot will not be put in any awkward positions, keeping it safe and secure. The display of the ProForm 1110 E Elliptical Trainer is getting a lot of praises for its quality and very user-friendly interface. It is certainly a very handy tool when tracking your progress on the machine, so you’ll know whether you are truly reaping the elliptical machine benefits that you are aiming for. Its silent operation is also a major plus, since users do not want to be distracted by awkward or distracting noises while working out. The iPad holder is also a good addition, so others can have fun (or even work!) while on the machine. This machine is neither small nor lightweight. With a 78 x 27 x 78 inch footprint, some may find it a bit bulky. It is also quite on the heavy side, and this is already noticeable even during the assembly stage. Fortunately, it has the transport wheels so moving it from one part of your home to another is easier. There is no denying that an elliptical machine will definitely aid you in achieving your fitness and workout goals, but if you want to get these elliptical machine benefits faster, then you have to pick the right machine. The ProForm 1110 E Elliptical Trainer is definitely a force to reckon with, ticking all the boxes when it comes to quality, performance, comfort, and value for money.